It’s 7:35 on a Thursday evening in Welland. The kids karate class is starting to leave the dojo. As they exit, the kendo students enter. It’s easy to see who’s in kendo and who’s in karate. The kendoka (kendo students) wear indigo coloured uniforms, which are a sharp contrast to the white uniforms of the karate kids. In addition, the kendoka are wearing armour, carrying their helmets and shinai (bamboo swords). While they’re friendly and polite, they’re also focused. They know what’s coming. After a few moments of pleasantries, the senior student announces the start of the warmup. Depending on the day, warmups are the traditional sets of stretches you’ll find in almost every dojo, or a set of dynamic stretching exercises created for the Canadian Kendo Team by a sports conditioning specialist. Either way, the students loudly count from 1 to 10 in Japanese, stretching in time, knowing that they need to warm up well. When you come to kendo, it’s best not to start off cold. SEIRETSU!!! The instructor’s call echoes through the dojo. Quickly, the kendoka assemble their kit and line up, ordered by rank, more senior students to the left. On command, they kneel into seiza and arrange their shinai, helmets and gauntlets so they line up neatly with the senior student’s, aware that their instructors eyes are on them, ensuring proper etiquette is being observed. When you come to kendo, you’d best be mindful and respectful. MOKUSO!!! A loud call from the senior student announces the start of the pre-class meditation. A cluttered, unfocused mind is an unnecessary distraction, so the meditation is meant to give students a chance to clear their heads of the problems they face outside the dojo. In the time it takes to breathe in deeply and exhale 7 times, students are encouraged to put their focus towards positive thoughts, on the techniques they intend to improve today, on being present in the moment. Newer students not used to kneeling in seiza begin to shift and sway slightly. More seasoned students power through, knowing any discomfort they feel now is just a taste of what’s to come. At last, the senior student gives the command to open one’s eyes and as a group, the students and instructor bow, first to the dojo’s shomen area, then to each other. Again, proper etiquette must be followed. Bowing to shomen shows respect to the purpose and principles of kendo. Bowing to each other demonstrates both respect and gratitude. One can’t do kendo alone. A partner is required. Anyone who is willing to participate in kendo deserves respect from their fellow participants. Another command rings out. This one informs students to ensure their bogu (armour) is tightly secured and to put on their helmet (men) and gauntlets (kote). Senior students help newer students to properly tie their head towels. It looks simple, but a loose head towel won’t absorb sweat or cushion blows as well as a well tied one. Attention to detail is important. Tying on the helmet is also given a lot of attention. When you’re going to receive a hundred or so strikes to the head, wearing your helmet properly is essential for safety and comfort. Well, relative comfort, anyway. Basic drills in kendo quickly sharpen your senses. The first drill, kirikaeshi, involves one person making 21 strikes against a partner, who in turn must parry, keep a proper distance, and coordinate with their partner’s movements. It’s a quick drill. The first person in the pair usually finishes their strikes in 20 seconds or less. They then become the receiver. In under a minute, 42 strikes are delivered, 36 parries are made, and everyone’s blood is flowing vigorously. Spirits rise as the kirikaeshi drill is repeated three to five times in as many minutes. It’s a fast start to the rest of the drills which feature large, small and combination strikes to the head, wrist, and torso. By the end of the basic drills, most students are sweaty, breathing hard, and totally pumped and ready to spar. Sparring is where each player’s skills and style are tested, because at its root, kendo is combat. It’s highly stylized, even ritualized combat, but it’s combat nevertheless. For all of its simplicity, it’s not easy. One might think that hitting someone in the head with a stick doesn’t require any particular skill. That’s true if your target is standing still, defenseless, but your sparring partner is neither remaining still nor defenseless. They’re looking to make a valid strike on you, probing your defenses, looking for weaknesses, finding opportunities and exploiting them. All while maintaining good form, a strong focus, and striking with determination, intent, and spirit. An outsider might watch a kendo match and merely perceive two people hitting each other with bamboo swords. That would miss the point. There’s more to kendo than is apparent to a casual observer. How you hit is important. A strike’s accuracy, control, distance, timing and intent are all factors that go into determining whether a strike is valid. An accidental strike is not counted. Nor is a strike that is not followed by a display of zanshin, a state of remaining spirit and awareness. Kendo requires you to unify your mind, body, and spirit in expression of a valid strike. One reality kendo students must face is that they will be hit. A lot. Every student who dons armour will be hit repeatedly in the head, wrist, torso, and occasionally, the throat. Sometimes those hits are made by students still developing their accuracy or control. Poorly controlled or wayward strikes can leave bruises, even with armour. Especially when people strike unarmoured body parts. It hurts, but kendo students move on. While they may receive an awkward strike, they’ve also made them. It’s an inevitable part of training. Learning to let go and focus on what’s next despite one’s own discomfort is an invaluable teaching of kendo. Continuing on in the face of adversity helps create an indomitable spirit. When the sparring’s over, the senior student gives the command for everyone to bow to their partner to finish the practice. Sweaty and exhausted students now line up by rank and remove their armour, arranging their kit in proper form. Another short meditation gives students the opportunity to reflect on their training, their strengths, and what needs to be improved. Finally, after a bow to the instructors, practice is over. One hundred and twenty minutes have flown by. Students share stories and show off bruises and welts as they stow their armour and fold their uniforms, paying careful attention to each knot, crease and fold. While practice is over, training the self doesn’t end. Kendo’s tough, and it should be, because one of its main benefits is the development of a strong character. It is through enduring, withstanding, or overcoming adversity that one’s spirit is forged. If kendo were easy, it would be pointless. Despite being a less practical martial art, earnest kendo training improves your mind, your body, and your spirit. 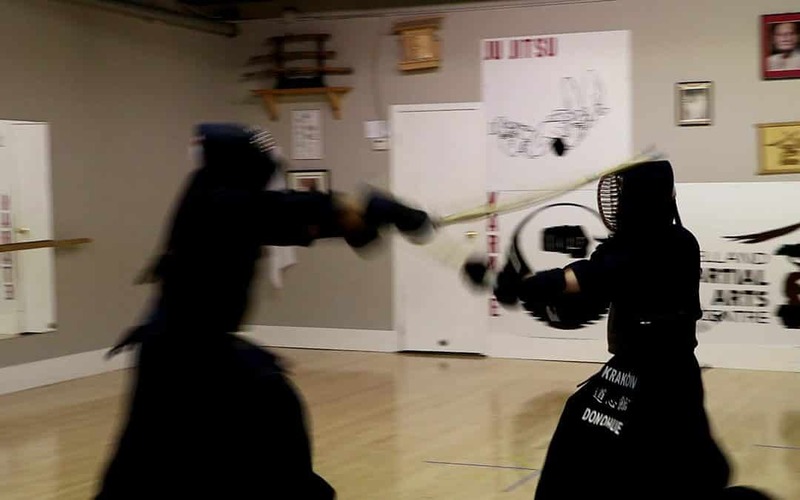 Through kendo, you’ll improve your your aerobic and anaerobic fitness, your breathing capacity, balance, coordination, posture, and your overall health. In addition to all that, you’ll gain internal strength, improved self-esteem, confidence, discipline, and respect for yourself and for others. Changes don’t happen overnight, but changes will occur. You may not notice them happening, but others will. Self-improvement inevitably leads to changes around you, as you adjust how you deal with your environment, your peers, your life. Overcoming challenges in the dojo develops internal strength of character. Kendo requires exertion on all levels, thus making it an ideal way to develop all parts of one’s self, in the relative safety of the dojo. If you are looking to improve your life, you first need to improve your self. Kendo is the “Way of the Sword”. It is also a way to create a better life for you and everyone around you. Improve your self, improve our world.